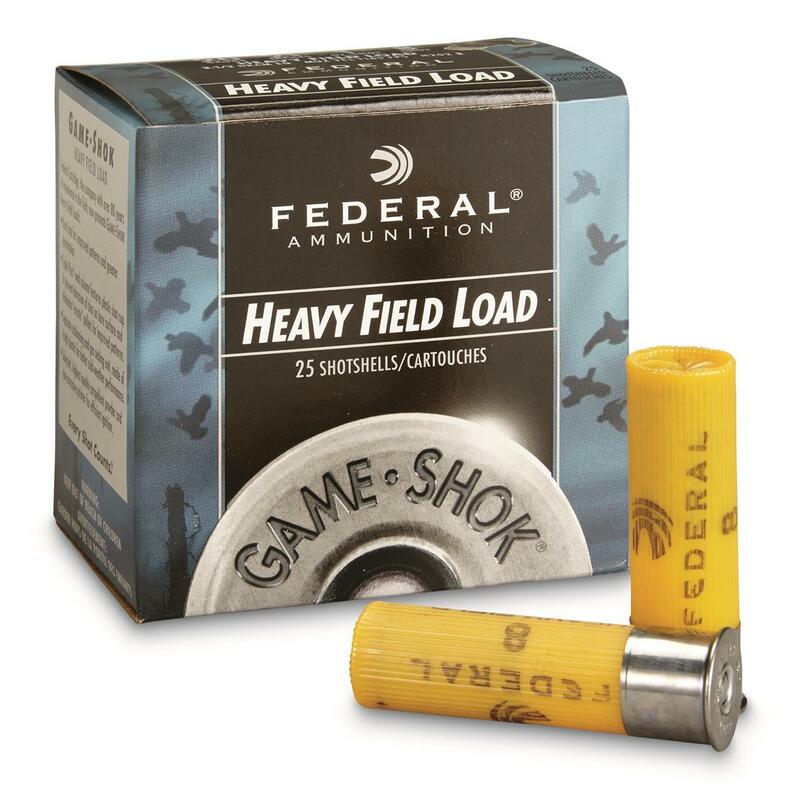 Federal® Game-Shok Heavy Field Loads are medium weight lead shot and power loads that provide excellent performance with moderate recoil. Federal, Game-Shok Heavy Field, 20 Gauge, 2 3/4 , 1 oz. Shotshell, 25 Rounds is rated 4.9 out of 5 by 24. Rated 5 out of 5 by Roger from Excellent price Price was very good. Can't comment on performance since I have not fired them. Rated 5 out of 5 by BillyBob from GREAT SHELLS! These are my go to shells for squirrels in 20 & 12 gauge. Best I have found and shoot great in all my shotguns. Good price as well! I keep coming back for more. Rated 5 out of 5 by BillyBob from Great Price! These are my go to shells in 12 & 20 gauge for small game hunting. They have never let me down & function perfect in all my shotguns automatic & pump. I ordered mine early this year while they were in stock. Rated 5 out of 5 by gravy from Outstanding ammo My shotshell needs are varied. This fills the niche very well. Federal makes a fine shotshell. I remember using Federals back in the 1960's, they never failed to please. Rated 5 out of 5 by gravy from Just what I wanted I have several 20 gauge and I use both the 2 3/4 and 3" versions. Federal is a good brand and these work well. As the title says, they are just what I wanted. Rated 5 out of 5 by BillyBob from Great Price! These are my favorite squirrel loads in 20 gauge as well as 12 gauge. I use #6 shot and seldom ever miss.